Movie Review - 'Philomena,' 'The Hunger Games: Catching Fire' NPR's Bob Mondello reviews The Hunger Games: Catching Fire and Philomena -- radically different films whose heroines have surprisingly similar qualities. Jennifer Lawrence makes her second appearance as the savvy, steel-spined Katniss Everdeen in the dystopian Hunger Games series. It's a fact of Hollywood life that the movie industry is dominated by men. Male stars make more money. Male executives make more decisions. And the vast majority of films are about what men do, or think, or blow up. But this weekend, two heroines are the backbone — the impressively sturdy backbone — of two very different pictures. 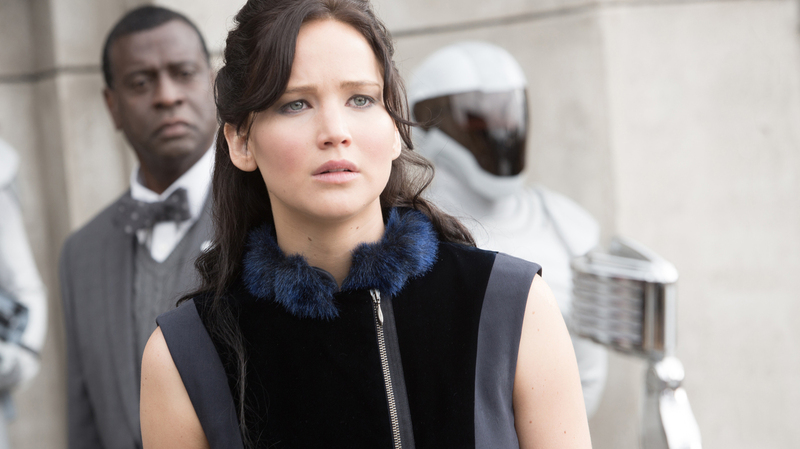 When it comes to dystopian fiction, there aren't a lot of characters I'd rather have on my side than Katniss Everdeen. The 17-year-old warrior heroine of Catching Fire — Part 2 of the four-part Hunger Games "trilogy," if you can get your head around that — may wear more eye shadow than Cleopatra this time, but that doesn't mean she's not fierce. Sent to do battle in the life-and-death TV ritual her totalitarian society uses to help subjugate its citizens, Katiss (Jennifer Lawrence) is an archer who can take out a saber-toothed baboon at 50 paces — and a strategist who you just know will get the better of Donald Sutherland's evil dictator, President Snow, and his new strategist, Plutarch Heavensbee (Phillip Seymour Hoffman). 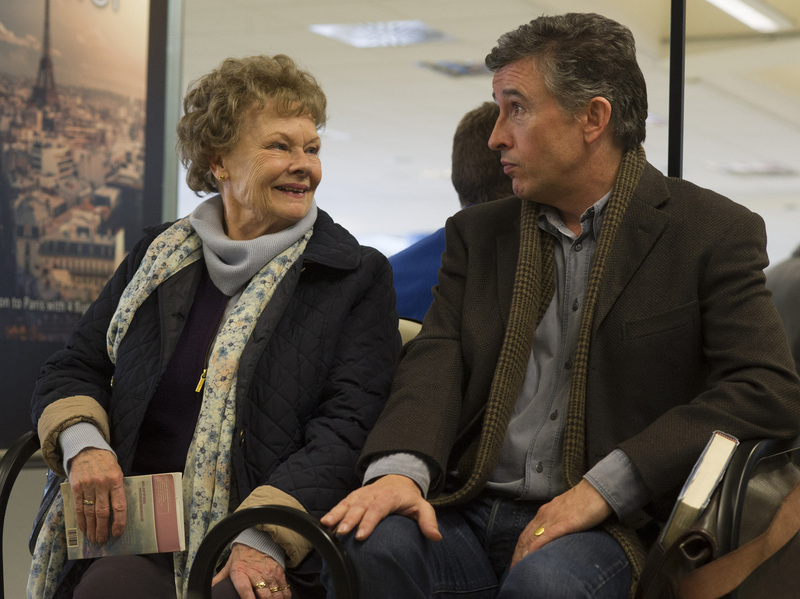 Philomena (Judi Dench) proves to have her own strength as she and journalist Martin Sixsmith (Steve Coogan) set out on a search for her stolen son. Being a sequel, it starts in the middle, without much exposition, though there's still an hour-plus of flaming-costume fittings and chariot parades before Katniss gets to kick behind. Personally, I'll be happier when she ditches the eye shadow for the revolution, but that's the third Hunger Games book, not the second; it's going to be split into two movies, and given the strength of this installment, I'd say the box-office odds continue to be, in that Hunger Games catchphrase, "ever in its favor." Katniss tends to look skeptically at the men in her life, but she does take advice from a hard-drinking fatalist, Haymitch, played by Woody Harrelson. And in Philomena, a true story about battling a dictatorial society in the recent past, the title character (Judi Dench) also has a male fatalist around to nudge her into action: Martin Sixsmith (Steve Coogan), a journalist turned government spokesman who'd fallen on hard times in 2004. Once the BBC's "man in Moscow," Sixsmith has been reduced to scrounging at cocktail parties for a way back into journalism, mostly hearing story ideas he immediately resists. One story, though, sticks with him: an unmarried Irish teenager sent by her Catholic family to have her baby in a convent. The child is then taken from her and put up for adoption, and the nuns stonewall her questions for decades. The two meet, and click — awkwardly — and there they are, a humor-challenged, working-class grandmother yearning for her long-lost son, and a snarky, upper-crust writer yearning for redemption. Matched recovery stories: How's that for human interest? Director Stephen Frears, working from a book by the real Martin Sixsmith, isn't about to let the Irish church off the hook for a monstrous (and well-documented) chapter in its history. In flashbacks, he pictures the young Philomena as a sort of proto-Katniss, doing battle with a tyranny of nuns. That this rebel grew up to be Dench's chatterbox of an older Philomena does exasperate Coogan's Martin. But he'll discover there's steel in her, too. And that allows a story that might have been mined purely for tears and anger to inspire both laughter and a startling degree of forgiveness.